We try to do EAST every year (or East Austin Studio Tour for those of you not in Austin). 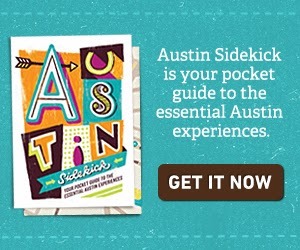 If you're not from Austin, you might not know that EAST is, "A self-guided tour to see works by hundreds of Austin artists. For several days in November, artists, studios, exhibition spaces, pop-up shows, and tons of fun art-centered events on the east side will be open and free to the public to celebrate the wide variety of art being created in our city." Essentially, every art studio, gallery, etc in east Austin throws open their doors to the public and displays their works. It's a great pair of weekends for art nerds like me. However, as I've found out, small children don't appreciate a weekend filled with art tours as much as you might. So this year was a little limited. Their home itself is interesting outside of the art. This is the kid's room, with some really neat paint drippings along the top of the walls. And this is the front yard, with Tim Burton like yard art. I've always believed that interesting people live in interesting homes — be them mid-century homes or otherwise. And the little peeks into other peoples' homes that EAST allows me only furthers that belief. I have an artist friend who always has interesting things in, on and around her house, so I agree with you about interesting people and their interesting homes.